I cut a small collar (to the left of the white block with the red cable tie) to guide the tubing up over the edge of the ink cartridge holder, with a ramp from the upper edge and raised edges to hold the tubes in place, from a block of black closed-cell foam. It seems perfectly happy to do its job without anything other than the tubes holding it in place atop the cartridges. There’s also a block of foam filling a gap under the printer’s top frame member (along the far left edge of the picture) to cushion the tubes as they whack against the edge. I’ve dumped a few more tanks of waste ink down the drain. When this printer eventually gives up, I’ll get a color laser and move on. This entry was posted on 2017-12-10, 07:24 and is filed under Machine Shop. You can follow any responses to this entry through RSS 2.0. Both comments and pings are currently closed. I like the practically 0 maintenance of my color laser printer but you can’t print decent photos with it, unlike with (some) inkjets. 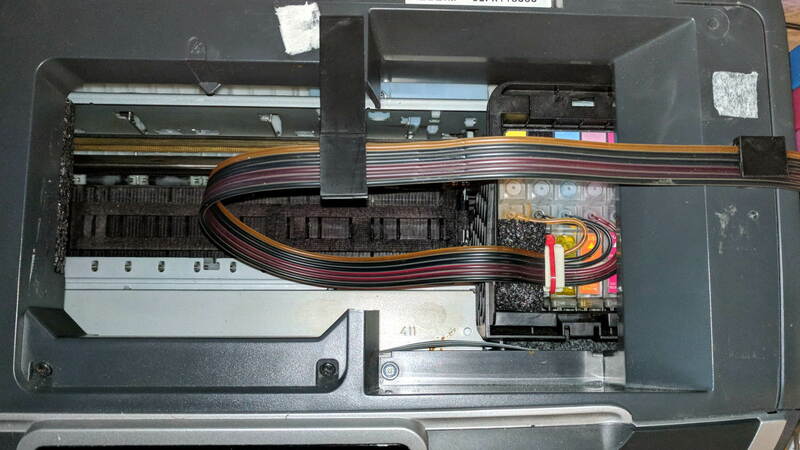 Aside from replacing cartridges, the one maintenance item I had to perform was, after 6 or 7 years I had to take it all apart and blow dust off all the mirrors. Apparently it doesn’t take much to have a huge affect on image quality. Oh, yeah, AND put it back together, again :-) .